What Is It For Anyway? A flowchart is used to explain processes. These processes can be software programs, automated procedures, or most importantly, human activities that must be coordinated, or conducted in a precise way. Using flowcharts can provide two important benefits. First, flowcharting gives you a way to analyze and better understand the process you are trying to explain. Second, flowcharting gives those who need to understand the process clear way to see the whole, and also to understand each step, and how the steps relate. 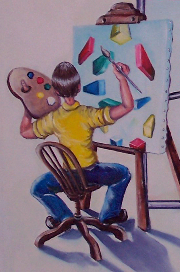 In an organization, activities are often complicated and involve the sequencing and coordination of many tasks, done by different individuals or groups. Those activites which are critical must be clearly understood and followed. Often, they need to change quickly to because of changes in the organization's environment. Often, they need to be made more efficient, or better suited to the marketplace. Flowcharts are also excellent training documents. New employees can better understand what is expected of them if their policies and procedures are illustrated with flowcharts. Flowcharting is a great way for a workgroup to better understand their environment. When a group sits down and constructs a flowchart they create a shared knowledge base of what needs to be done and how to do it. 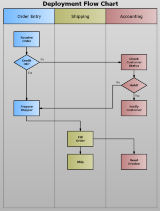 The above is a flowchart of the flowcharting activity. Even without knowing much about flowcharts, you should be able to geat the meaning easily. Flowcharting usually requires several iterations, especially for a complex activity. Sometimes each action in a process will need its own flowchart. As mentioned above, if it is a group activity, the group should participate in aspects of devleoping the flowchart. They should certainly be part of the review and refinement process. 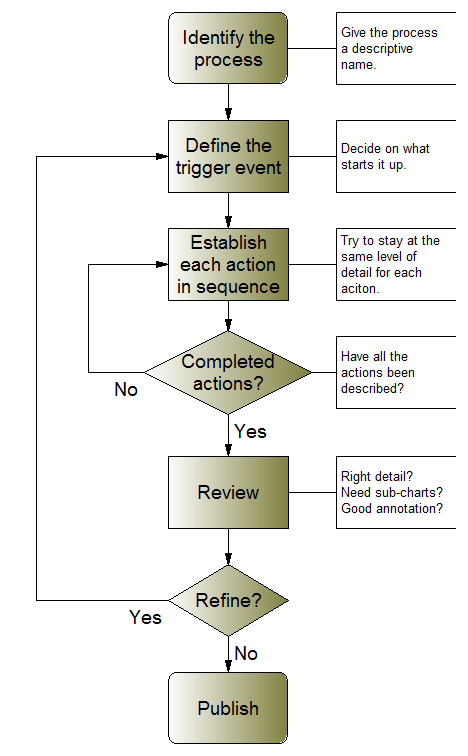 With a slight modification, a flowchart can be used to describe processes requiring coordination among different workgroups. These types of diagrams are often called "deployment flowcharts," since the process is distributed over multiple areas of responsibility. If the flow is organized horizontally rather than vertically, it is called a "swimlane" diagram. The illustration above shows the process of ordering and fullfillment. At the top there are the names of the three groups involved. Where the flow lines cross the group boundaries, indicated by the vertical lines, there is a "handoff" between groups. This type of diagram makes it clear that organized communications needs to take place between groups in certain places. Often a handoff document or form needs to be specified. If that is the case, the flowchart should refer to that document or form. In fact, each step in the overview chart may need to be expanded as a sub-flowchart of its own. If that is the case, then commentary should be added to the diagram, referring to these sub-charts. While there are many hundreds of specialized flowchart shapes, only a few are commonly used. 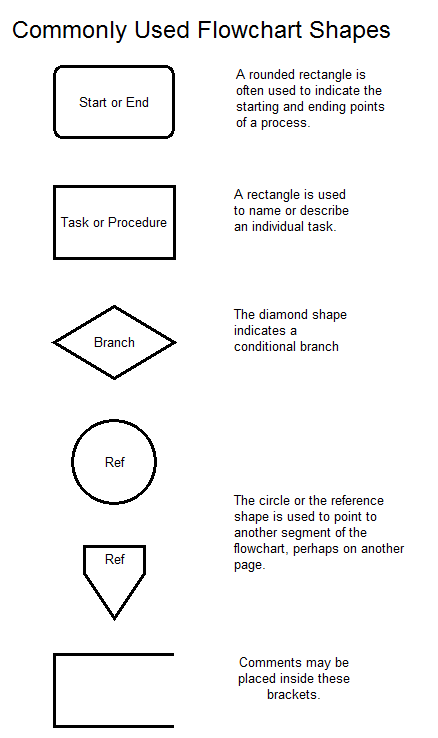 The above shapes are universally used in flowcharts, and a sufficient to descride most processes. With a graphical user interface, a good software application can save you a lot of time developing flowcharts. Since, as you can see, the process is iterative, you need an application that makes it convenient to make changes, and does not interfere with the thought process. Take a look at Chartist by Novagraph. It is one of the best around, as its users will testify. You can purchase it at absolutely no risk, or you can try it out for free.